Do you remember playing this game years ago. 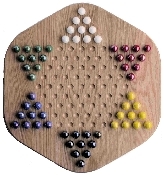 This game is the same as our standard Chinese Checkers game but on a larger board and with larger marbles (7/8"). The board is made out of solid Oak and finished with a durable finish. All our wood is specially selected for grain and color. Comes with a set of 60 colorful marbles and playing instructions. For ages 5 and up.